you will learn to count stars like dreams. As they walk in the steel shadows of skyscrapers, Gonzales reminds his daughter of the giant Mayan pyramids “that too lived amongst the heavens.” As they fly together through the skies, he tells her that there are “questions we all ask when we are learning what it means to be human”—and “questions this world will ask,” some curious and others hostile. Amini’s digitally rendered collage-style art, on a vibrant, jewel-toned palette, features bold, exuberant designs and expressions that complement Gonzales’ careful and loving teachings. Every detail has meaning, and Amini’s bright, stylized art reflects the multicultural and multiethnic nature of Islam. Throughout, Gonzales’ Afro-Mexica daughter wears a beautiful Mexica orange, red and green embroidered-and-fringed dress, along with striped leggings for modesty; when she’s not barefoot, her shoes of choice are the ever-popular Crocs. And, as a child, she wears hijab only when she prays. 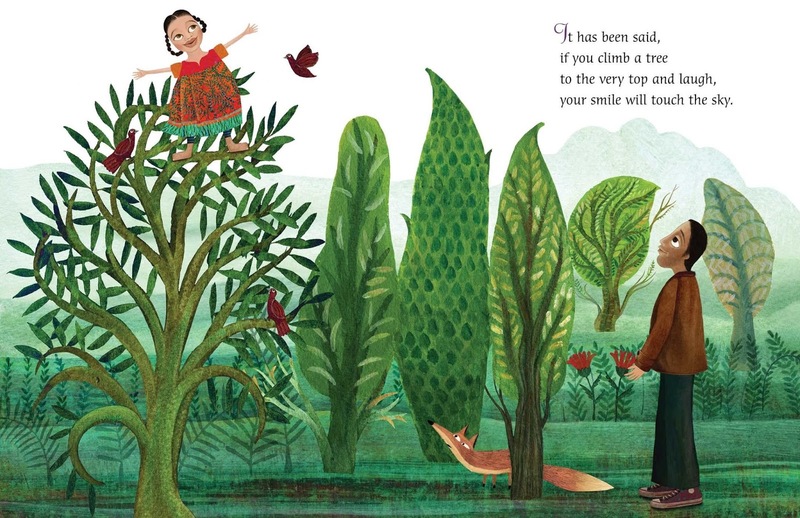 In many illustrations, the child’s eyebrows are raised, sometimes questioning, sometimes in wonder. In most, she is depicted with her father or her mother, rarely alone, always protected. 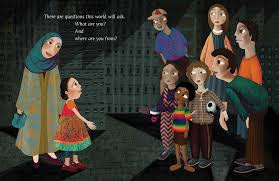 When the child proffers her hand to a curious group of strangers, her mother, a hijabi who wears a beautifully patterned jilbab, empowers her daughter by quietly standing behind her; but when other strangers appear less than friendly, her mother turns to her daughter, takes her hand and calmly speaks to her. and a place almost as old as time. Mi abuelo worked the fields. Surrounded by the love and protection of her faith, her parents and her community, Gonzales’ young daughter is standing confidently on the top branches of a tree, arms spread to take in all the world. She is counting stars like dreams and soaring over the minarets with a flock of geese. She is contemplating the ancient Mayan pyramids in the steel shadows of skyscrapers and meditating in a mosque. She is receiving the blessings that hummingbirds send with their wings and listening to the ancient drums in the hoofbeats of horses and the sweet music of the angels. This lyrical, compassionate, and intensely personal book is for all Muslim children—no, for all children. 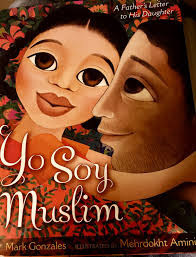 Yo Soy Muslim is highly, highly recommended. Thank you to my dear friends, Nasira Abdul-Aleem, Hadiyah Abdul-Mu’min, Shohreh Doustani, Mehdi Rajabzadeh, and Reyhaneh Rajabzadeh.